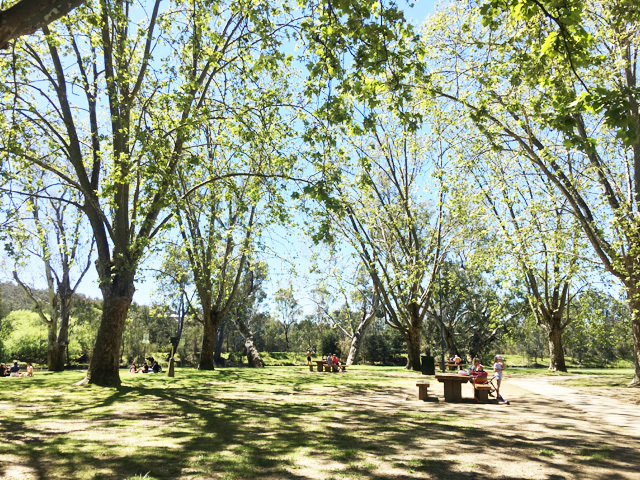 Noreuil Park and River Deck Café in Albury is the perfect place to stop over for a coffee, a bite to eat and a play on your way to Melbourne or back to Sydney if you’re driving through. The Noreuil Park is a fantastic spot overlooking the gorgeous Murray River. Great for a play at the playground, a picnic, catching up with friends and family for a coffee and a bite to eat. There’s lots of shade trees, picnic tables, lots of grass to sit, relax and watch the river water pass by and watch ducks. There is no fencing near the river so watch your little ones if they love exploring, I know mine do. The playground is a great setup with swings, a seesaw, a great structure with slides, monkey bars, climbing sides and more. We loved getting takeaway coffee and lunch at the River Café. We loved their coffee and sticky chai tea, eggs & bacon in a brioche bun and the kids loved the chicken & chips! You’ll love this great stopover! There is also the nearby Oddies Creek Park which is an inclusive play space which caters for all ages and abilities which also features a flying fox, basket swing, toilets, BBQ and picnic area, musical sculptures, sandpit and climbing walls. And the gorgeous Children’s Garden part of the Albury Botanic Gardens. For more ideas of what to do with the kids when you get to Melbourne, checkout our Website, our Daily Spots List, CBD Spots or Blog. Or if you’re heading to Sydney, checkout our Website, our Daily Spots List or Blog.